The packet format frame is a part of various output related dialog boxes. It provides options to select which parts of a packet should be used for the output function. Packet summary line enable the output of the summary line, just as in the “Packet List” pane. Packet details enable the output of the packet details tree. All collapsed the info from the “Packet Details” pane in “all collapsed” state. As displayed the info from the “Packet Details” pane in the current state. All expanded the info from the “Packet Details” pane in “all expanded” state. Packet bytes enable the output of the packet bytes, just as in the “Packet Bytes” pane. Each packet on a new page put each packet on a separate page (e.g. 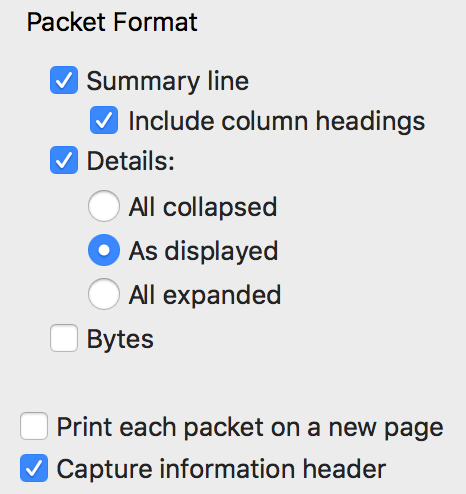 when saving/printing to a text file, this will put a form feed character between the packets).